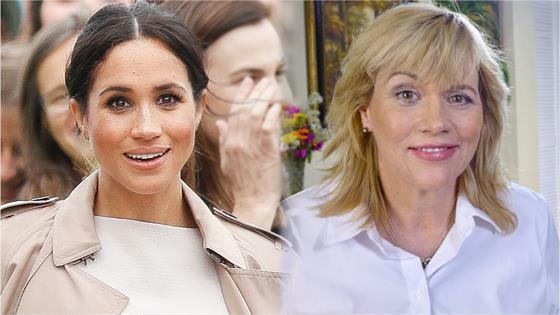 Meghan Markle "doesn't have a heart" and is not a victim, her estranged half-sister Samantha Markle says in a new documentary that focuses on the Duchess of Sussex's family feud. There is no love lost between the two and Samantha has often spoken out against the royal in recent years, namely over her and husband Prince Harry's estrangement from their father, Thomas Markle, which began after their 2018 wedding, over his participation in staged paparazzi photos, for which he had apologized. Thomas has since spoken out against the royal family in general, while continuously making public pleas for Meghan to speak to him. "She doesn't have a heart, or she would have been doing everything she could to make him comfortable and reciprocate and be loving and gracious and make sure he's comfortable in his old age," Samantha says in an interview on Meghan and the Markles: A Family at War, which aired on the U.K.'s Channel 5 on Friday. "So, broken heart? No, his heart's broken. She can't turn herself into the victim here." Meghan and the royal family have not responded publicly to Samantha's comments and never have before as well. Last month, their father shared with the media a 2018 letter that he claims was written to him by Meghan. In it, she allegedly claims he stopped answering his phone and "chose to only speak to tabloids." She accuses him and Samantha of lying to the press about her and also allegedly adds that she "barely knows" her half-sister. "That letter was strategic, it was so elegantly written and contrived," Samantha says in the documentary, as seen in a video posted by the Daily Mail. "She was basically saying that, you know, my dad had been a liar, that I was a liar. He has text messages on his phone galore. This is a no-brainer. The evidence all says she was not contacting him, so it doesn't matter what her letter says." "There are a lifespan of pictures and experiences together, so maybe it's convenient for her, that in her mind, she doesn't know us because she doesn't want to because she wants [to take] center stage," Samantha continues. "I wasn't maliciously lying. I was pointing out what the world was already seeing. I pointed out that humanitarians don't treat their father coldly. Was that a lie? No, because the world watched it happen to my dad, and the world watched her do it." The documentary notes that Meghan's friends dispute this. In the documentary, Samantha also reveals that her family's feud with Meghan began after Harry said in a 2017 BBC Radio 4 interview that he supposes that his royal family is the one she "never had." "The first thing I thought was I don't think Harry has been given the full story," Samantha says on the program, according to the Daily Mail. "Something was not right. Though we weren't the classic family together on schedule for every holiday, we were family."